Born in Barcelona. In Dr Sole 1984 graduated in Biology in the Autonomous University of Barcelona and he received his PhD in Biology in 1988 from the same University. He studied for his thesis in the Department of Cell Biology under supervision of Maria Dolors Coll and Maria Rosa Caballín. From 1988 he worked in the Hospital Creu Roja of Barcelona under the supervision of Dra. Soledad Woessner. In 1991 he moved to the Hospital Central l'Aliança (Barcelona) and in 1997 he moved to the Hospital del Mar, Barcelona. From 2000 to 2012 he was Chief of Section in the Laboratory of Cytogenetics and Molecular Genetics and in October 2012 he moved to the Josep Carreras Leukaemia Research Institute, Campus ICO-Germans Trias i Pujol, Badalona (Barcelona). Currently Dr Sole is the Scientific Director for the Campus ICO-GTiPl, at the IJC, Director of the Cytogenetic Platform and principal investigator of the MDS Group. Dr. Solé is one of the world's leading authorities on Cytogenetics in Myelodysplasia. He was involved in the recent IPSS-R. Dr. Solé is a reviewer for the following journals: Blood, Leukemia, Genes Chromosomes and Cancer, Haematologica, Leukemia Research, Leukemia and Lymphoma . 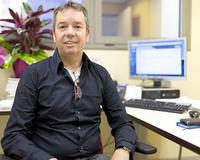 He is an associate professor at the Universitat Pompeu Fabra (Barcelona) and the Autonomous University of Barcelona. From 1996 until 2008 he was the coordinator of the Spanish Cytogenetic in Hematology Working Group. From 2004 until 2012 was a member of the Steering Committee of the Cytogenetic Hematologic Quality Control from Eurogenest.